Wow, I am still somewhat speechless... I didn't think that Ottawa would come out with that much fire and the Pens would be so flat. I kept telling myself that it was only Game 1 and it was in Ottawa... I was not confident that they would win the first one, but I didn't think that they were going to be manhandled like that. It seemed like they couldn't do anything right last night. They were out hit, out shot, out skated, the list goes on. I am hoping that it was only nerves of being in the playoffs. Here's to a 2 day rest and a bounce back in Game 2!!! Let's go Pens. Dear lord, what an awful beat down. 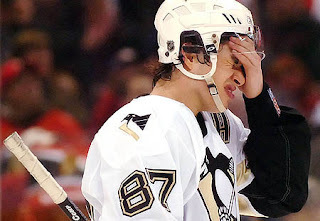 The Pens are going to come back on Saturday remembering this, and it's going to be one hell of a game. I know, that's what I'm counting on!